Most students are happy to work hard, try their best and accept the consequences. But there are a host of commercial essay writers who are prepared to help those who can't be bothered. Marek Jezek is the pseudonym he's currently using, but there have been many others. He's bright, hard-working, and loves learning - loves the intellectual challenge of taking on a new subject. And there have been many. "Philosophy, psychology, nursing, education, physics," he lists, counting them off on his fingers, "criminology, hospitality management, ethics, management." The marks are all first-class, and there's a long list of the universities where the work was submitted. A dissertation is supposed to be the culmination of years of study for students - the piece of original research and extended writing where a student demonstrates their understanding and expertise in their subject. Not if someone like Jezek has written it for you. He's a freelance writer, a pen for hire, in an industry which appears to be growing rapidly. Commercial essay writing firms are becoming increasingly blatant in their appeals to students. On the London Underground network last month, one firm placed paid-for posters at stations close to universities. "Need help with essay?" they asked, claiming to be "trusted by 10,000+ students". When I contacted Transport for London (TFL), the underground operator, and pointed out the nature of the service the firm was advertising, TFL said they hadn't realised and would take down the posters and not accept any more. Last week another company was distributing handy credit-card style adverts to students on the campus at Queen Mary University London, claiming to be "the original and best academic writing service - helping you get the grades you desire". One website allows students to post their essay assignments and deadlines on it, and writers bid to do the work for them. Universities seem to be struggling to catch up. The big concern is that bespoke essays, written to order, without being plagiarised themselves, are difficult if not impossible to detect. Almost all universities use anti-plagiarism software, called Turnitin, which checks a submitted essay against published sources, looking for copied phrases. But this software will not raise suspicions about an original essay produced by a professional writer. Prices from commercial firms range from about £150 for a bit of coursework, to thousands of pounds for a dissertation. Marek Jezek charges about £2,500 for a dissertation. He says he has a particular motive for the work he does - revenge. What can universities do to combat commercial essay writing? 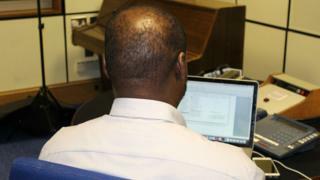 He has an MBA and a PhD from a leading British University, and says he has applied for more than 300 jobs as a lecturer or researcher, but has got nowhere. He believes he's a victim of racial discrimination. Jezek is originally from DR Congo, and describes a network of black academics from African backgrounds that are unable to find work in universities. "In a sense it's an emotional retribution for a wrong that's been done to me," he says, "For me it is a way of satisfying myself and satisfying my ego, because I'm feeling rejected unfairly. I get a bit of emotional satisfaction when a student gives me a call and tells me he got 70% or 80% for the work I did." Jezek gets his work through word of mouth among students. But he also says some universities are unwittingly collaborating by referring struggling students to him for private coaching in essay writing skills. "The student sends you a piece of work to appraise, but in most cases once you've sent the first set of comments, the second or third, the student just throws in the towel." It is often suggested that it is international students in particular using these services, but Jezek says in the past few years more British students are commissioning dissertations from him. He says they often lack basic grammar and writing skills and believes secondary schools have failed to prepare them for university. He also believes higher education tuition fees have had an impact on attitudes, making a university degree seem more like a financial transaction. "A student will come to me and say that they have been paying a lot of money throughout their degree and they don't want to waste it." Universities have responded to the threat by trying to change the way they assess students. Increasingly students are being asked to orally present their work in front of a seminar group, or to answer questions from lecturers. Sometimes students are asked to submit study notes, early drafts, and work in progress. However essay firms have thought of that. For an extra fee, notes and drafts are available too. Dr Adam Longcroft, academic director at the University of East Anglia (UEA), says oral presentations are hard to fake, and can be extremely challenging. "Many students find it really nerve-wracking. Public speaking is a major phobia for a lot of people, but it is really important that any student develops that expertise." A measure designed to eliminate discrimination from the marking system makes it even harder to catch student cheats. Many universities have a policy of anonymous submission of work, so a lecturer cannot unconsciously mark down an ethnic minority student. But if a marker does not know who has submitted a piece of work, an excellent essay submitted by a mediocre student would not raise any suspicion. Sometimes though, fakes can be weeded out by keen observation skills. Plagiarism Officer Sarah Allen, at the UEA Business School, recently investigated a post-graduate student who submitted an excellent piece of work which stood out to the marker simply because it contained one unusual word - cynosure. The Oxford English Dictionary defines it as a person or thing which is the centre of attention or admiration. "We didn't know what it meant," she says, "We had to go away and look it up, and we were intrigued that this student knew what the word meant." It turned out that the student had poor English skills, and when challenged about the essay, could not explain his work. "Eventually the student admitted that they had sent the question to someone who was a post-graduate student in the United States who had written it for them. "Because all the work is submitted anonymously we have no idea what student has submitted the work - whether it's an international student, a home student, an excellent student or a struggling student - so it is quite difficult to identify these suspicious cases." Deliberate cases of premeditated cheating are dealt with by a hearing of the university council, and a guilty student is likely to be expelled. It is the student submitting the work as their own who is guilty of cheating, not the company or writer producing it. Does Jezek feel guilty about helping students cheat? "I feel the guilt is a shared guilt," he says, "But we are just a small cog in the machinery. And let me put it this way. I don't think universities' hands are clean." He believes some universities fail to investigate suspicious cases because they lack the evidence, and fear the impact on their reputations if too many cases of cheating are revealed. This is a view also expressed by some university lecturers who contacted the BBC following reporting of the issue on Radio 4's PM programme. Universities deny that they condone any form of cheating, and say they take the issue very seriously. The Quality Assurance Agency, which oversees standards in higher education, recently launched an inquiry to determine the impact of essay-writing companies. Prof Phil Newton, from Swansea University, says the major hurdle to overcome is evidence. "The single biggest problem with the issue is that it's difficult to detect. And if you're going to accuse a student of cheating you need very good evidence to back up the allegation." A petition was recently launched at parliament to outlaw essay-writing companies, but it is a problem which legislation is unlikely to kill. Bespoke essays are increasingly produced in countries like India, China, and Australia. But Sarah Allen, at UEA, says it needs more attention from universities. "We need to really stamp on it now very firmly. "It is devaluing the qualifications of anyone who holds a degree. It devalues the work the majority of students are putting in to obtaining their degree. And it makes a mockery of the whole university system."